It’s a dry heat… that’s what they say in Phoenix when it is 115, and in Florida and Georgia, at 95 degrees, it’s a wet heat…. Golfers, in the summer you are suffering needlessly. 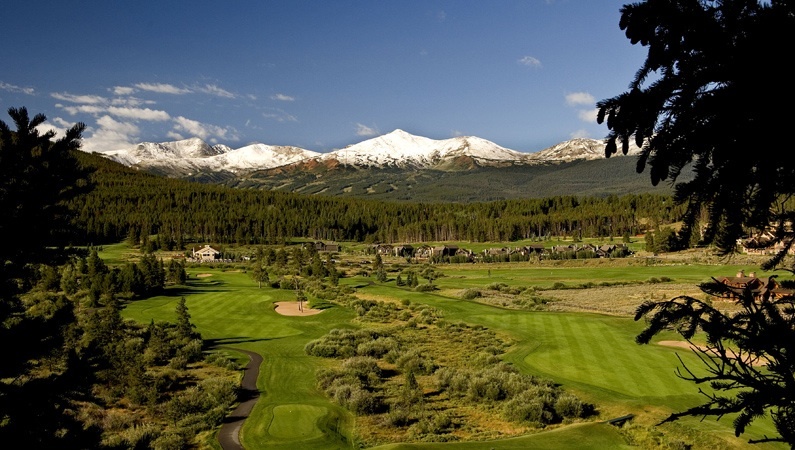 You could be golfing in Breckenridge, Colorado, home of the only 27-holes of Jack Nicklaus designed golf course in the world! What are you waiting for? The course is stunning, set in a beautiful mountain valley at almost 9500 feet. At this elevations this high, you look like a pro – the golf ball encounters less air resistance, so it flies farther and straighter than at lower elevations. And all of this while enjoying the stunning blue skies and warm mountain sunshine without the sweltering humidity or blistering heat of other locations, as daytime summer temperatures range from 65 degrees to 80 degrees. World class golfing in the summer and world reknown skiing in the winter, not to mention biking, fly fishing, kayaking, hiking, great restaurants, shops, and music – so, what are you waiting for? It is time to make Breckenridge, Colorado your second home. A really smart way to do that is through purchase of fractional real estate. This allows you to have a luxury second home that really does have all of the comforts of home, and absolutely none of the hassles. You own the deed, you pay the mortgage – but you don’t have the repairs, the concern when you are not there. And you only purchase the weeks when you will actually use the property, so it makes perfect sense. Luxury fractional real estate is available at Grand Lodge on Peak 7 in Breckenridge but inventory is almost sold out. Luxury condos from studio to four bedroom, slopeside, and ski in, ski out access, fully furnished in casual mountain elegance, plus world-class resort style amenities including a spa, movie theatre, aquatics center, fitness center, concierge, and more all await the smart owners at Grand Lodge on Peak 7. What are you waiting for? Almost heaven awaits. Pick up the phone and call Brent Henry, Senior Broker, and let him know what you are hoping for. Brent’s number is 970-485-2117. He will help you find the perfect home away from home for you. Or, fill out the convenient form below and he will get right back with you. There is no better fractional real estate opportunity out there in all of Summit County, just ask the owners at Grand Lodge on Peak 7! This entry was posted on August 9, 2014 by elevatemarketingaz. It was filed under Breckenridge Colorado Luxury Condo Sales, Breckenridge Luxury Condo Sales, Breckenridge Real Estate, Breckenridge, CO Real Estate, Breckenridge, Colorado Real Estate, Fractional Ownership Real Estate, Fractional Ownership Real Estate Breckenridge CO, Fractional Ownership Real Estate Summit County Colorado, Fractional Ownership Real Estate Summit County, Co, Fractional Real Estate Breckenridge, Fractional Real Estate Breckenridge Colorado, Grand Lodge on Peak 7 Breckenridge, Colorado, Luxury Fractional Real Estate, Luxury Fractional Real Estate Breckenridge CO, Luxury Fractional Real Estate Breckenridge Colorado, Luxury Fractional Real Estate Summit County, Co, Luxury Fractional Real Estate Summit County, Colorado, Real Estate Breckenridge, Real Estate Breckenridge Colorado, Ski In, Ski Out Luxury Condo Breckenridge Co, Ski In, Ski Out Luxury Condo Breckenridge Colorado, Ski In, Ski Out Luxury Condo Summit County, Co, Ski In, Ski Out Luxury Condo Summit County, Colorado, Summit County Co Real Estate, Summit County Colorado Luxury Condo Sales, Summit County Colorado Real Estate, Summit County Real Estate, Summit County, Co Luxury Condo Sales and was tagged with Breckenridge, Breckenridge Colorado, Breckenridge Colorado accomodations, Breckenridge Colorado condos, Breckenridge Colorado skiing, Breckenridge luxury condo sales, Brent Henry Breckenridge real estate broker, Grand Lodge on Peak 7, luxurious condos, ski in, ski out real estate breckenridge colorado, ski_in_ski_out Breckenridge condo, Summit County Real Estate.